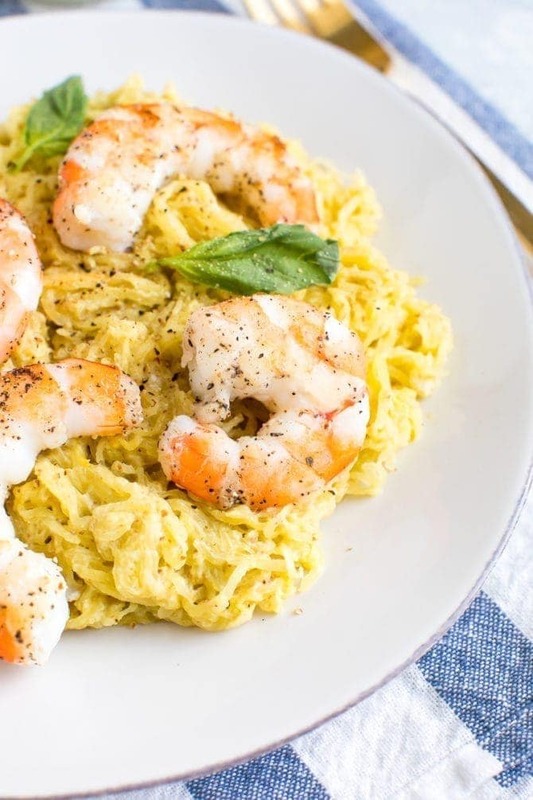 This 4-ingredient pesto spaghetti squash features a creamy almond pesto sauce and is topped with cooked shrimp for a low-carb, protein-packed meal. Diary-free and gluten-free. 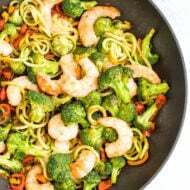 This recipe is inspired by a couple reader requests: meal prep tips and simple weeknight recipes! It takes some time to master, but I love meal prepping certain ingredients that can be used in a variety of ways. This almond pesto dip (which is a homemade version of pesto Bitchin’ Sauce) is the perfect example of that. You can make this pesto dip/sauce once and use it in soooo many different ways. I love it as a snack with veggies or crackers, for breakfast on toast with eggs and for dinner as a pizza or pasta sauce. So many uses! 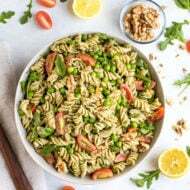 Because you’re enjoying it in so many ways and pairing it with different ingredients, you can rest assured that won’t dread eating it at the end of the week. Promise. And I should mention that this pesto sauce isn’t your traditional herby pesto sauce. It’s almond based so it’s extra creamy with a little punch and tang. This recipe obviously also falls under the category of simple weeknight recipes because it’s only 4 ingredients (once the sauce is made!). Of course, we’re not counting olive oil, salt and pepper. I used roasted spaghetti squash as the base, but if you’re craving actual pasta, you can always swap in the Barilla legume pasta that I’ve been raving about. It tastes just like “regular” pasta but has a ton of added nutrients. I paired this with shrimp because I love how quickly it cooks up, but I’d be willing to bet any protein source would pair well with this sauce! Lastly, we’re topping the dish with fresh basil to really bring all of the flavors together. 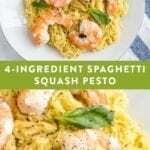 If you try this simple spaghetti squash pesto recipe be sure to leave a comment and star rating below letting me know how it turned out. Your feedback is so helpful for the EBF team and other EBF readers. 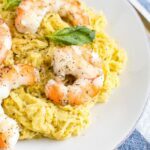 This 4-ingredient pesto spaghetti squash uses a bright and fresh diary-free almond pesto and is topped with cooked shrimp for a low-carb, protein-packed meal. Make almond pesto dip. This step can be done 1-2 days in advance. Roast spaghetti squash as instructed in the linked recipe and remove noodle strands. This step can be done 1-2 days in advance as well. 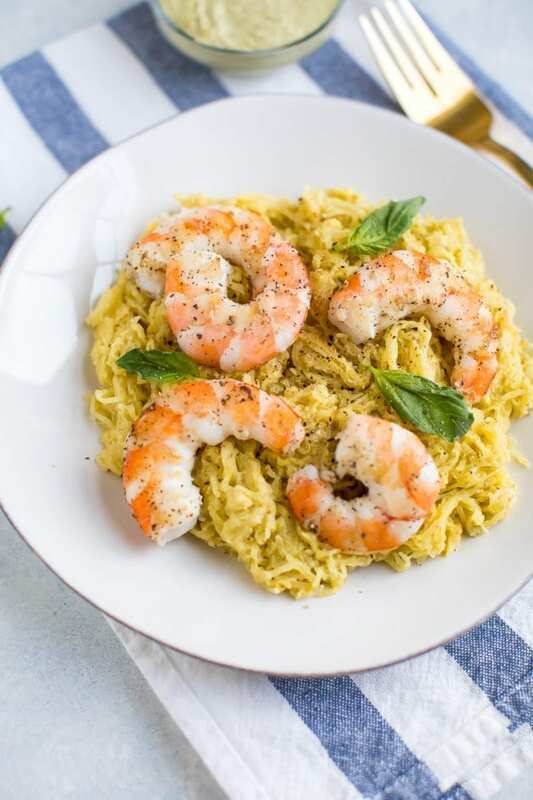 If you’re roasting the spaghetti squash the day of, start cooking your shrimp when the squash has about 5 minutes left of roasting. Cook shrimp by adding oil to a large sauté pan over medium high heat. Tilt pan so the oil coats the bottom. Once oil is hot add shrimp, season liberally with salt and pepper and cook until shrimp are pink and opaque. This should take about 5 minutes, but will depend on the size of your shrimp and how many you have in the pan. Transfer shrimp to a plate and add roasted spaghetti squash noodles into the pan. This step is especially important if you roasted your squash ahead of time and it’s coming cold from the fridge. Add almond pesto sauce to the pan with the squash and toss to coat. Spaghetti squash can get clumpy so just continue tossing until the noodles are coated. Transfer spaghetti squash mixture to plates, top with cooked shrimp. Sprinkle on chopped basil, if using. 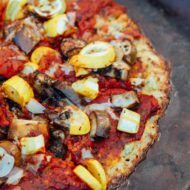 I also have an eCookbook filled with 35 recipes all made from 5 ingredients or less. Check out Fit With Five here! Simple meals FTW!